Last year I exhibited a collection called Reflection in Nature at Snape Maltings. It was well received and I loved the feedback I got from my visitors. I had wanted to exhibit it again and was thrilled when MF Frames in Ipswich invited me to showcase some of my work in their window next month in February. There are some that debate the question of whether or not photography is art. It isn’t as easy as saying it is or isn’t. Art is subjective and personal in it’s interpretation. All mediums (not just the camera or pencil) as outlets for creativity can be included. We only have to look at Tracy Emin using a bed or Damien Hirst using a cow in formaldehyde as an “art installation” to demonstrate the extremity of what is classified as art. It is totally subjective. I see things around me constantly that please my eye. Sometimes the natural image itself is enough for me to want to capture it and with the amazing capabilities of the latest digital cameras sometimes I can actually capture it but there are times when what I see in my mind is slightly different eg I might want to turn it mono or because of light limitations and it cannot be captured, so we use freedom of expression and perhaps some tweaking in Photoshop to accomplish the result we see in our minds. 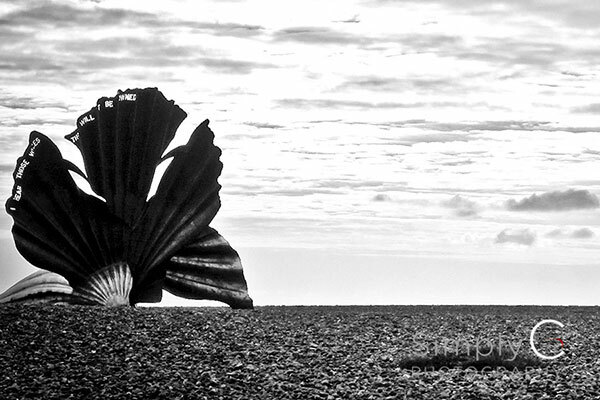 You’ll see, if you drop down in the Suffolk Images tab, and go to my Aldeburgh Scallop images in blue and yellow that there is a big play in Photoshop, hanging side by side framed A3 as sisters, they work and balance beautifully, in my mind. Love it or hate it the scallop juxtaposed on such a wide blank sweeping beach landscape is already a bold statement triggering daily debate, therefore a further twist in my mind and on the final image I feel only adds to it’s irony and appeal. At the end of the day I hope my work brings pleasure. Each picture that is sold gives me a warm feeling knowing it means something to the new owner and they recognise and see what I see, natural creativity and art in everyday surroundings. Hope you like the collection and as always I would love to hear your thoughts on what I have captured or indeed any images you would like me to capture for you using my candid eye. Art is in portraiture, pets, children and everyday items and it gives me a great deal of pleasure capturing it for others.